<October 22, 2018>: The Advisory Board of the Community Foundation for Mason County recently approved grant awards to a variety of community organizations in support of projects throughout Mason County. A total of $71,069 was awarded from Unrestricted and Field of Interest Funds through the competitive application process, overseen by numerous volunteer committees. 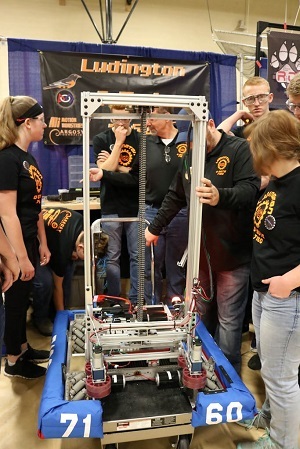 Ludington High School Robotics (photo, right) received a grant of $5,000 to establish a 21st century technology training program for their teams facilitated by local industry experts. City of Ludington was awarded $10,000 to redevelop a dead-end road and parking area into a usable pedestrian plaza improving access at Sterns Beach Recreation Area Water Trailhead. Lakeshore Food 4 Kids received $2,500 toward the Hunger Doesn’t Take a Break program, providing a holiday box of food to address food insecurity over the long holiday break from school. PoWer! Book Bags was awarded $2,500 to provide literacy materials for children at five sites of family assistance in Mason County. District Health Department #10 received $1,500 to help develop a multi-school Youth Prevention Ambassador Team in Mason County. Read the full grants list here. Grant applications are accepted twice each year, once in the spring and again in the fall. Nonprofit organizations interested in seeking grant support from the Community Foundation are encouraged visit the Grants section of our website for additional information about the process. <May 8, 2018>: The Advisory Board of the Community Foundation for Mason County recently approved grant awards to a variety of community organizations in support of projects throughout Mason County. A total of $77,095 was awarded from Unrestricted and Field of Interest Funds through the competitive application process, overseen by numerous volunteer committees. Friends of Ludington State Park received a grant of $5,465 to build a family-friendly, highly accessible playground at the Hamlin Lake picnic area, a site used extensively by both tourists and local residents alike. Ludington Area School District was awarded $10,000 in support of their Orange and Black Pack program, working to close the food insecurity gap for secondary students in the district. 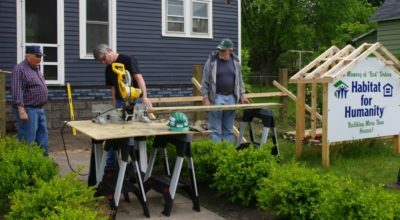 Habitat for Humanity of Mason County received a grant of $5,000 to provide funding for critical home repairs to qualifying homeowners. Spectrum Health Ludington Hospital Foundation was awarded $7,000 to support Reach Out and Read, a pediatric, medical-based literacy program. Ludington Area Center for the Arts/Ludington Arts Council received a grant of $5,000 to support the film upgrade project that will provide the community the ability to view cultural, educational, and recreational films at the Ludington Area Center for the Arts, providing an underprivileged area more educational resources through film. “These grants, through the support of our donors, continue to have a positive impact on economic development, education, family support, and recreation opportunities in the community we are lucky to call home,” said Andrea Large, Foundation executive director. A complete list of spring 2018 grant awards is available at here.